Today I feel like a child at Christmas. I sent away for ten obituaries from the Carnegie Library of Pittsburgh. They will look up five events for $10. So, considering the parking is five dollars and it would take me hours I decided it was a bargain. I hope I am able to glean some information about my ancestors. I told my daughter that if she puts my picture in my obit, do not put my high school graduation pic, and do not put in one that makes me look awful. Somewhere in my 50's or 60's would be nice. When my father died in 2004 I selected a picture of my Mom and Dad together and had it printed on the back of the prayer card. Mom had died in 1995 so I think it looked good. Ellen O'Rourke obit and to my surprise it stated that she had her viewing at home. Now, did the undertaker come to the house and prepare the body? Was this the custom or was it done out of economic necessity? Her death was in 1924, I really have not read anything about the practice, although I know they had viewings at home in the Old Country. Anyhow, the envelope was just mailed this week. so I guess it will come with the information in about a month. I then will need to contact the State of PA for copies of the death certificates to see what information I can get from them. I also need to send another inquiry to the Diocese of Pittsburgh to obtain other information about newly discovered relatives. My Dad had the death certificate from Patrick and Ellen O'Rourke and I did not find much. Is this because the children did not know or wasn't getting the information a priority? I have to tell about that miserable looking child yesterday. That child is me. My parents were building the house them selves and I was always running out into the street. 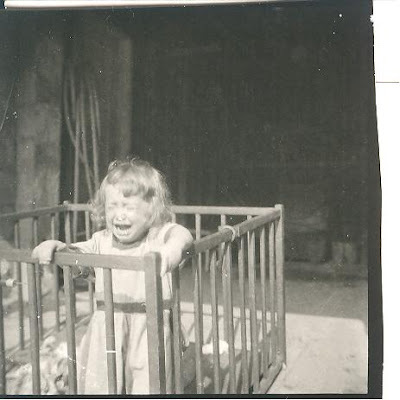 They tied me to the playpen so I would not get hurt. I turned out OK, actually I am working and paying more than my share of taxes. The blog prompt suggested a visit to the cemetery and talk about your relatives. What I have is sort of a mystery, at least to me. I have the original certificate from Monongahela Cemetery purchased by my Great Grandfather Patrick O’Rourke. It was purchased on 15 August 1891. According to the files the first person buried there was Ellen, his wife, in 1924. How do I prove my suspicion that Dennis O’Rourke (son) and Loretta O’Rourke (daughter) d.1894 are buried there? I can’t imagine someone buying a cemetery lot without the need, especially when money was an issue. In the Allegheny County Death Index, Loretta is listed as being buried there. But the cemetery has no records of those two children. There are listed two lots as empty, is someone occupying those places. On the census of 1900 it states that they had ten children and six were living at that time. I did find that John and Joseph O’Rourke were buried there as infants, which I did not know. Each answer begets another series of questions. These men are Chucks relatives, and Emily as well. Chucks Great Grandfather Anton Sperl. Chucks Grandfather John Christ Sperl. Chucks dad Joseph Sperl with Emily circa 1990. Chuck and Emily circa 1994. The Sperl Family emigrated from Bohemia in 1869. I guess you would consider them Austrian now, Chuck does like coffee and sweets. My great grandfather Heinrich Theodor Fredrich Schridde and my grandfather Willi Schridde. My great grandfather Patrick O’Rourke. My great grandfather Daniel Zachiaris Bartels. And I wish I had a picture of Thomas Dowd my great grandfather. Spent a few hours at the LDS Family History Center. I find it difficult to navigate. I know information is there but you seem to have exact search terms to find what you want. I am looking for Church records from Mayo County, Ireland. It also took me a hour to get on Footnote and I did find the Naturalization record for Emil August Bartels in 1929. His sponsors were Charles and Alwine BARTELS Dietrich, his Uncle and Aunt. On ANCESTRY I found the census records of London UK 1851. It has listed a Patrick Mortel, age 38, along with his wife Mary and children Catherine, James, Mary and 6 month old Ellen. My great grandmother Ellen Martel had listed her birthday as in 1852 and her father as Patrick. This looks good to me as a possibility. Patrick and his wife Mary and some of the children were born in Ireland. Ellen was born in England, according to the census. Those names of the children were the same ones that Ellen had named some of her own children here in East Pittsburgh PA.
What percentage of the Irish left Ireland and went to England during the famine? Was it only the people who could afford to go? I tried to down load the record to this Blog but could not do that. I am always hampered by technical glitches. Yesterday I was at the Carnegie Library of Pittsburgh. I was perusing Footnote and all I could find was the Declaration of Intent for Emil August Bartels. He was my grandmother's (Anna Bartels Schridde) brother. On the declaration it stated that Hamburg was his home. He was 21 years of age, did he live with his parents? Or, did he live on his own. At this time it would have been c. 1923 and the Great War was over. Germany had such hyperinflation, I suspect he lived at home and immigrated to find a new life. His Aunts and Uncles were here and they probably encouraged him to come and work in the steel mills. I wonder how he felt to leave home and come to the former enemy, the USA? The thing about Footnote is that when I was at the LDS Church I was finding all sorts of record, and while at the library I could not find the ones that I already had made copies of the documents...I need to figure out what I am doing wrong with my searches on Footnote. Today Chuck and I went to St Anthony's Cemetery to see if I could get some information on record. I was interested in his gggranparents Christof and Margaretha BUCHL Sperl. They died in the early 1900's and their death record stated they were buried in St. Anthony's. I also wanted to find some of his great uncles who disappeared off the census roster sometime between 1910 and 1920. What I did find out was there was a fire in the 1960's and the records do not exist..........The records they do have is because someone went and recorded all the transcriptions from the existing stones and the records from the deaths post 1960 is all they have. So back to the drawing board, which ever it is. I was able to get a photo for my cousin Julie, she wanted one of her grandparents. Mission accomplished on that end. I guess when we go to Uniondale those records will be gone too, but, maybe they will have a stone. Well, this morning I added Google Site Translator to this blog. I was hoping that perhaps someone researching the same lines in German or other place in Europe would be able to click, translate and add a comment..... This is the second one I have done and it appears, at this point in time, to be working. Genealogy group meeting this morning and then Chuck and I will be off to research the Sperl, Nosseck and other lines and perhaps take pictures of the headstone. Not much going on yesterday so I had some time to research the Bartels again. On the the 1920 census I found William Bartels living with The Deitrichs and he was listed as brother in law. William and Alwine were siblings. William was listed as divorced, I bet that was a shocker in the 1910 to 1920 era. It was also listed that he was born in 1864 and immigrated in 1882. Next to immigration record. It was easier to find a likely subject with dates. Then I found his name on the ships manifest. Along with him (age 23) was listed Georg Bartels (age 22). Looks like another sibling appears to add to the mystery. I searched for Georg on the census rosters but I can't find him anywhere. McConnells Mill State Park is the setting for this picture. It was taken circa 1927, The young girl is my mother Gerda Schridde and to the left are my grandparents Anna Bartels and Willi Schridde. I had wondered who the couple next to them are? Is the man with the vest the elusive William Bartels (Anna Bartels Uncle)? Who is the woman, I think one of the Bartels sisters, and who took the pictures, I know that one remains unanswered. The suspected William Bartels appears to old to be Anna's brother August, because August would be in his early twenties and that man appears to be in his forties or fifties. Today I was off and while looking for some banking I saw my folder with my genealogy papers that were my fathers. First I found the original cemetery lot papers from 1891. It was really strange looking at that paper. Which of his children had died at that time? Loretta had died c. 1894, so was it the elusive Dennis who drowned at that time? It was purchased in the summer, 15 August 1891 to be exact. I do not think a person would just go out and buy a lot of graves with no reason. The lots are in Monongahela Cemetery. There is a story about that cemetery. Nothing spooky, but a bit interesting. Back about in the 1890's. Monongahela Cemetery was part of a large cemetery, which included a Catholic section. The workers at the mills and the mines would take a short cut thru the cemetery to get from work to home. With all that traffic the road started to deteriorate, and the officials asked the Catholics to help with the upkeep, they refused. This led to the Protestants to build a eight foot wall and separate the two cemeteries. So, it seems my grandfathers original lot was in one and now is on the Catholic side close to the wall. Monongahela does not have the records, and a perusal of the Roots Web Information said that the records were kept at St. Thomas Church and that church burnt down on 30 December 1983, and the records were lost. Another trip is in order, now that I have the lot location, hopefully, I can find some information about it when I go. But, more likely, they were too poor to place tombstone.